SharePoint Case Studies | SharePoint Legal Case Management | Colligo Networks inc.
National Grid is one of the world’s largest utility companies, safely delivering energy around the world in a reliable and efficient system. National Grid is one of the largest investor-owned energy companies in the world. They play a significant role in the delivery of gas and electricity to millions of people across the UK and Northeastern US. National Grid needed to upgrade and improve the document management system and processes of its legal department in order to improve team collaboration. Legal documents were being stored on a number of file servers and in personal folders on staff computers, which made sharing difficult, and affected the team’s ability to find information. Email correspondence remained on individuals’ computers and was not being stored with other case-related documents. However, National Grid also needed the capability to manage emails with other case-related documents. This requirement called for a way to quickly move Outlook emails into SharePoint, and to easily capture email metadata in order to properly index and store the files. To address the requirements of its legal department, National Grid chose SharePoint as its document management system, and, to address the specific need to manage emails along with other case-related documents in SharePoint, chose Colligo. 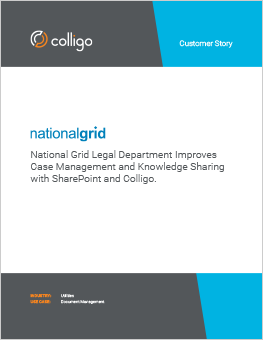 Colligo made it easy for National Grid’s legal staff to move emails from Outlook to SharePoint, while automatically capturing email metadata to organize and store case-related emails and documents. It also provides legal staff with offline access to SharePoint content when away from the office. After being introduced to Colligo and completing a successful pilot, National Grid deployed the solution to their legal department. The Colligo application enables legal staff to easily drag-and-drop emails into SharePoint document libraries, while automatically capturing email properties and mapping them to metadata columns in SharePoint. Because Colligo handles all the data transfer and synchronization in the background, there is no waiting for the operation to complete before working on other tasks. Colligo’s additional benefit is its ability for users to synch SharePoint content to their laptops so that they can access it when they are away from the office and disconnected from the network. The fact that SharePoint is accessed through the same Outlook folder tree whether online or offline keeps it simple and lets users access their matter files or move emails to SharePoint using the same interface and processes. Any emails added to connected SharePoint folders or changes made to documents while offline are automatically synchronized to SharePoint when users connect to the network. “Colligo has enabled the National Grid legal department to leverage the power of SharePoint for document management in a way that is familiar and seamless to our users,” concluded Davidson.